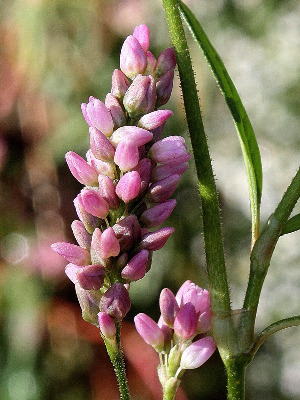 Polygonum pensylvanicum of Michigan Flora. Like P. lapathifolia, with which it is often associated, it may be abundant on recently exposed shores, river margins and banks, marshes, mucky hollows, old fields, moist or dry disturbed ground. An annual, readily recognized by the large fruits and flowers, in thick, erect, pink spikes. Occasionally the upper branches of the plant, in addition to the peduncles, are ± densely covered with stalked glands; at the other extreme, an eglandular form is known from northern Ohio. The copious achenes are an important food for waterfowl. MICHIGAN FLORA ONLINE. A. A. Reznicek, E. G. Voss, & B. S. Walters. February 2011. University of Michigan. Web. April 22, 2019. https://michiganflora.net/species.aspx?id=2288.